Today I ran to the top of a small mountain (okay, a hill) along the lake. 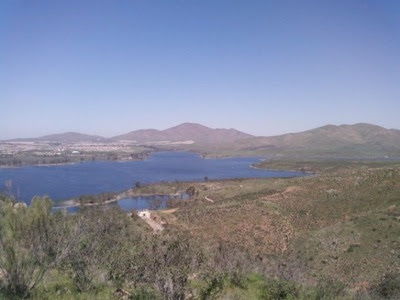 Lake Otay [where we paddle] is ridiculously gorgeous, and it's always amazing how you never remember that when you're two sets in to two-hours of sprint pieces with paddle-back rest. Weird. But, hey- I'm a nature girl! I wear a wool beanie; I have Solomon running shoes and a Swix water-bottle-holder. If that doesn't say "Wow this girl loves trail running" then I don't know what does. At the dam, the road turns into an entrance to Otay Lakes Park, which I believe is the last speck of American civilization. The park has a rocky trail up one of the smaller hill/mountain-by-Southern-California-standards things. I sprinted up to the top (just kidding, I walked) and then I gazed across the border at Mexico, picked some wildflowers (Keith Anderson, anyone? ), and sang “Climb Every Mountain” from the Sound of Music... really loudly, to scare away the rattlesnakes.